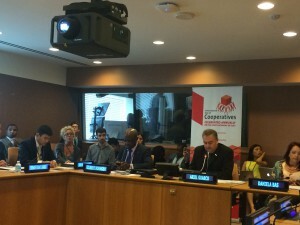 On 11 July 2016, high-level representatives of government, the United Nations, cooperatives, civil society, and the COPAC membership convened at the UN to celebrate the International Day of Cooperatives. More than sixty people participated in the event, which was followed by a lunch to visit the COPAC photo exhibition, “Cooperatives: The power to act for a sustainable future”. See the exhibition catalogue. The event focused on the innovative approaches of cooperatives to achieve the Sustainable Development Goals (SDGs). She suggested planning a major event around cooperatives during the Commission for Social Development, which will next take place on 1-10 February 2017. This would be a way to mainstream cooperatives, create more partnerships, and use the momentum to propel beyond the International Day. Mahmoud Mohieldin, Senior Vice President for the 2030 Development Agenda, United Nations Relations, and Partnerships of the World Bank Group, highlighted the importance of data, implementation, and finance to achieve the SDGs. “As we search for innovative solutions to today’s development challenges, we should consider what the cooperative movement can offer. That means not only greater economic inclusion, higher agricultural productivity, strengthened food security, and financial stability, but also lessons concerning responsible and sustainable business practices, corporate governance, and community relations,” said Mr. Mohieldin. His Excellency Sebastiano Cardi, Permanent Representative of Italy to the UN, said, “The Italian government is deeply committed to further strengthening cooperatives and the social economy.” He noted that there are 80,000 cooperatives in Italy, that 30 of the 100 largest companies are cooperatives, and that cooperatives have a higher rate of employment than the domestic employment rate. Ms. Bas moderated the next session, “Cooperative solutions: Examples of innovation in achieving the SDGs.” She first addressed Sonia Maria Dias, Waste Sector Specialist for Women in Informal Employment: Globalizing and Organizing (WIEGO), who used the example of waste pickers’ cooperatives in Brazil to show how cooperatives offer decent work and empower women. Hélène Jolette of the Union des Producteurs Agricoles – Développement International (UPA/DI) in Canada, discussed the potential of innovative partnerships. UPA/ID works with the FAO to help cooperatives and producer organizations in the Maghreb improve food security, through training and increased access to resources and markets. William Rolleston, Vice President of the World Farmers’ Organisation, shared how New Zealand cooperatives are contributing to food security, hunger eradication, and the fight against climate change. He noted in particular the example of how cooperatives are joining forces in research and development to harmonize their efforts to increase productivity sustainably. “When you get farmers engaged, you get real outcomes,” Mr. Rolleston said. Rodrigo Gouveia, Director of Policy for the ICA, explained how the Co-ops for 2030 platform is helping cooperatives to align their work on sustainable development with the SDGs and share their progress with the world. Cooperatives have already made more than 100 pledges to achieve the SDGs since the platform’s launch on 2nd July. Next, Mr. Guarco shared the ICA’s International Day of Cooperatives video, which can be viewed here. See Mahmoud Mohieldin’s article on cooperatives for Project Syndicate. See the ILO’s list of resources on cooperatives and the SDGs.